Patient Education | Eastern Long Island, NY | Joseph F. Sciotto D.M.D. We’ll show you how to prevent injuries and maintain a beautiful, radiant smile. At Joseph F. Sciotto D.M.D., our primary goal is to help you maintain healthy teeth and gums in order to prevent the need for extensive and costly restoration services. We want you to live a happy life, starting with your smile! Many of our patients realize the importance of brushing, flossing and routine dental cleanings, but few truly understand the effects that oral health, good and bad, have on the rest of the body. We’re here to change that. 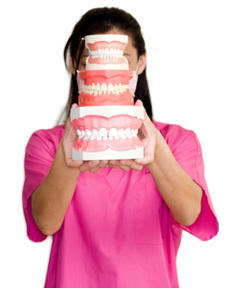 Our goal is to provide you with as many educational tools about dentistry as we can. Explaining how many teeth you have in your mouth, encouraging you not to ignore dental pain, sharing ways you can prevent dental injury and care for dental injuries are just a few of the many topics we can educate you on at our practice. We don’t want to see you in pain, we’d much rather see your smiling face! We encourage you to call us promptly whenever you suspect that something’s wrong. Browse our website and enjoy the resources we’ve put together so you and your family can have healthy and bright smiles! If you have questions, give us a call today! Email Joseph F. Sciotto D.M.D.